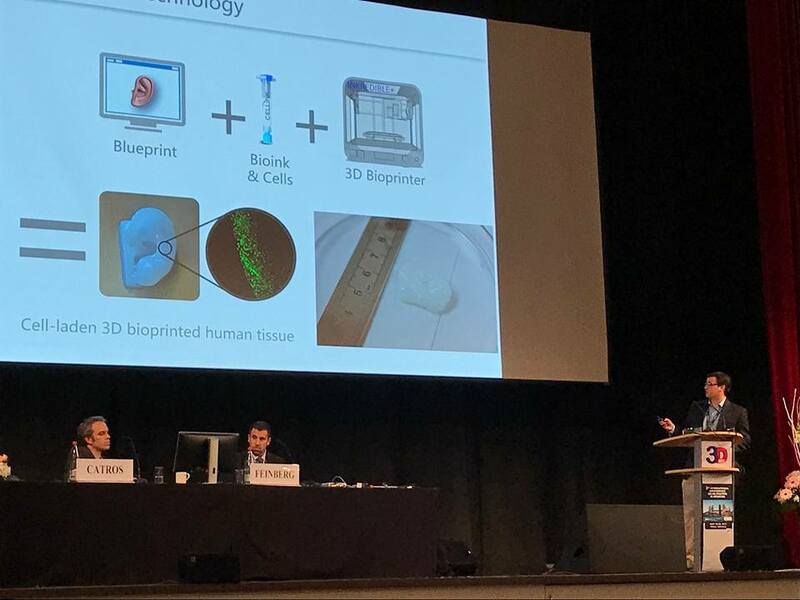 Last week I was able to present at the 3D Printing in Medicine Conference in Mainz, Germany. At the conference, there were a lot of excellent talks from leaders in the 3D printing field from across the world. And yes it was intimidating to be on the same stage of many of the big names whose papers I would read and use as my basis for some of my PhD work. In the talk I gave, I tried to come from the industry perspective with the attitude of someone (relatively) fresh out of academia. At CELLINK we collaborate with researchers in laboratories at universities all across the world on nearly every continent. Almost every lab is developing, testing, and printing their own bioink compositions. As the field develops, bioinks must move from the “micro-brewery” level of production to more standardized compositions to allow better reproducibility across research groups. Bioprinting promises to revolutionize the biomedical research field and ultimately the clinic through the rapid and reproducible fabrication of constructs and tissue structures. Why shouldn’t the bioinks utilized be consistent across the world? At CELLINK we are interested in working with researchers across academia and in industry in developing and moving toward the standardization of bioinks. Much like 20 years ago how every lab mixed their own cell culture media from the base units, bioinks are very lab specific at this stage. While broad patterns in bioink composition have emerged, lab specific fragmentation in bioink compositions exist. Furthermore, there is no standard for what constitutes a good ‘bioink’. Printability is highly dependent on many factors such as nozzle diameter, shape, length, and size, actuation mechanism, temperature, bioink viscosity, density, fluid content, homogeneity, particle size, cell density, and temperature. Furthermore, the extent to which printability is analyzed is often dependent on the laboratory from which the bioink was synthesized. For example, a lab may develop a bioink for a specific tissue application but this bioink may not be a good bioink for another tissue application. For the new researcher or the person looking to get involved in bioprinting, processing the rapidly growing literature in the field can be intimidating. Where does one start? Several immediate questions come to mind. Which parameters are more important than others in predicting printability across nozzles and printing techniques? Can predictive modeling be used to rapidly screen theoretical bioink compositions to identify the most feasible bioink candidates? Can algorithms be developed to rapidly and reproducibly analyze printability of a bioprinted filament in real-time, whether for bioink development or for printer self-calibration? Can standardized bioinks be developed that can be utilized for a wide range of tissue targets? Can these standardized bioinks be modified by the user with minimal disruption of printability for tailoring toward a specific application? Can analysis standards and algorithms (print patterns which specific curves, angles, shapes) for different nozzles and printing techniques be collaboratively developed and made open-source for broad use in the community? At CELLINK we challenge ourselves and we challenge the researchers in the field to reach out to their colleagues and talk about how they can work toward these goals.